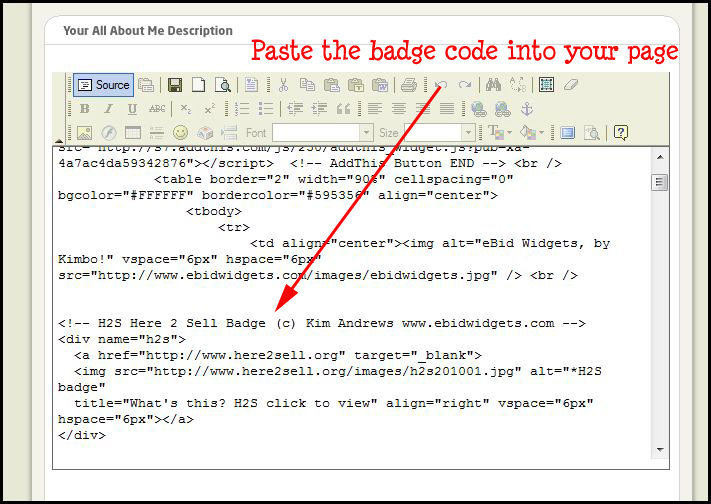 If you're not familiar with adding code to your eBid pages, here are some detailed instructions on how to add the H2S code to your All About Me page. You can also see an instructional video if you prefer that format. First of all, from the general "My eBid" menu, choose the appropriate option and click on it to open the All About Me maintenance page. Scroll down to the description box. 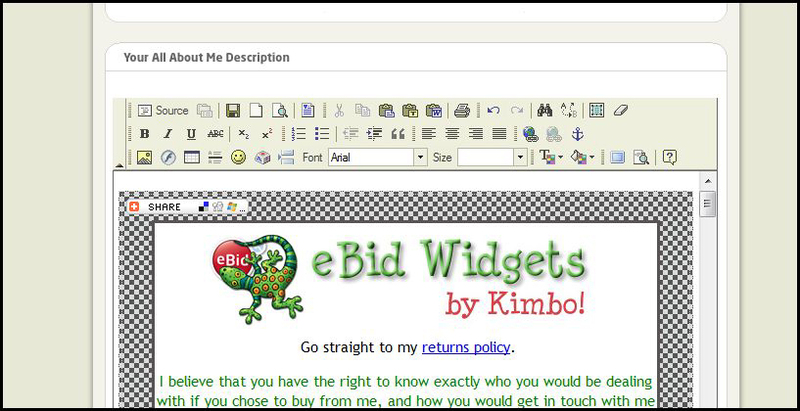 You should be working in Advanced WYSIWYG for the best results so if you don't see the same style editor as shown below, please select Advanced WYSIWYG using the link underneath the description box. 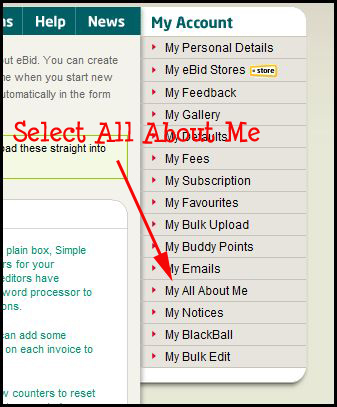 Your All About Me Description box should then show as in this example. 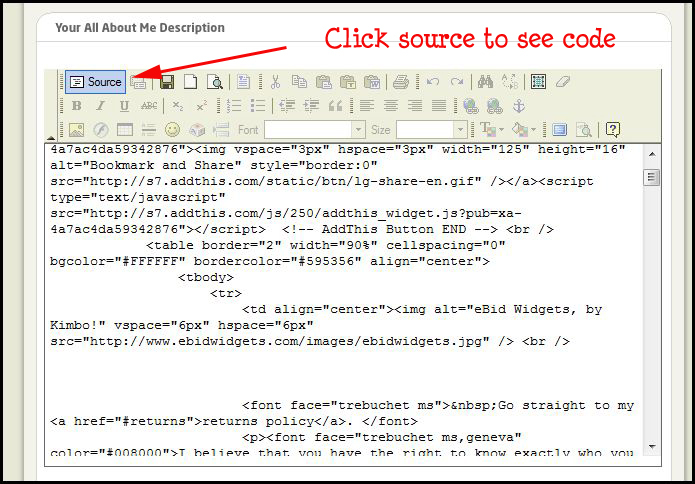 Click the "source" option top left to display the html code for your All About Me page. Choose where you want the badge to appear (very top or very bottom is obviously simplest to find!) and click in the box. If you press return a few times it will make a space in the code, which will make it easier to see what's happening. 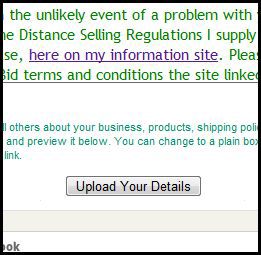 Switch to the H2S site in another tab/window (don't click out of your eBid page, you don't want to lose your work so far). In the H2S page click into the code box and select all the code in there. You can use Control-key & A to select all. Then copy the code to your computer's clipboard. You can use Control-key & C to do that. If you don't like that method, use right click and check for the copy & paste options in the pop-up menu. 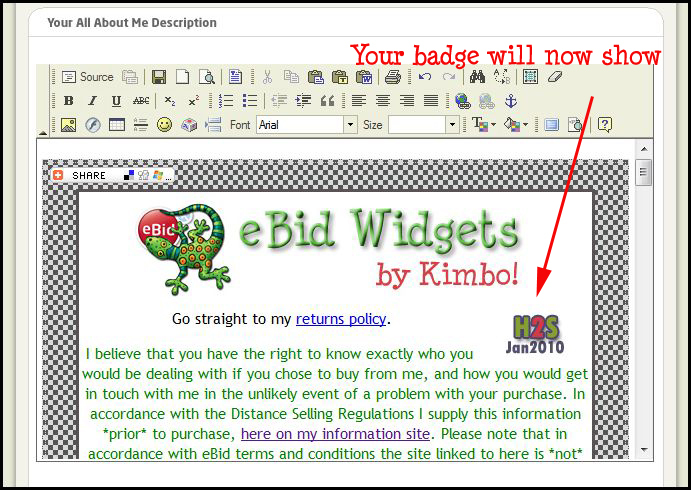 Switch back to your eBid page and the All About Me description code. Paste in the contents of your clipboard. You can do this using Control-key & V, or right click as above. The code from H2S will appear in your description page. Click off the "source" option to see your All About Me page draft in normal display mode. You will now be able to see the H2S badge displayed. It will automatically be aligned to the right of your description. In order to save your draft as the final version, remember to click the "Upload Your Details" button beneath the description box. For future updates when changing to the next month's badge, you simply need to change the name of the badge to the latest version, as given on the H2S front page. For example, changing "h2s200912" to "h2s201001" changes the badge displayed from December 2009 to January 2010. As you can see, the file name is built up of h2s plus year in YYYY format such as 2009, plus the month in MM format such as 12 or 02. Advertise your shop here & help support the scheme.